The Reinvent HER program, partnered with Illinois Department of VA and Illinois Joining Forces. This free program is geared to women veterans and women currently serving. Lunch/networking will open the program at noon. Around 12:45, the welcoming addresses and workshops follows. 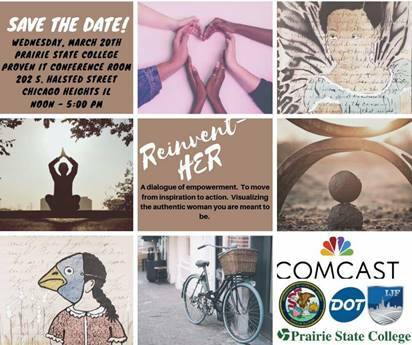 Here is a link to register: (Reinvent HER). The ReinventHER Forum is a dialogue of empowerment, which will help you visualize the authentic woman you are meant to be. Enjoy an afternoon of reflecting and discovering with other women who have served in our Armed Forces. This forum will explore topics such as mindfulness, self-love, discovering your true authentic self and how to tell your personal story with agency!